A lot of people look at me funny when I say it’s okay to clean your harp with a damp cloth. “You mean, like, put water on my harp?” they ask me. There’s a commonly held belief that lacquer finishes and water do not mix, and there’s certainly some truth to this. If you let water sit on a lacquered surface – say you keep a potted plant on your piano (please don’t do this!) and overflow from your watering gathers underneath the pot – it will seep into the finish, creating cloudiness or a white ring that is difficult to get rid of. If left unchecked, moisture trapped in a lacquer finish can cause an ugly dark mildew stain. However, this same lacquered surface, be it a piano or a dining room table or what have you, can be wiped clean with a damp cloth periodically without any damage, especially if you dry it once you’re done. The same is true of your harp. 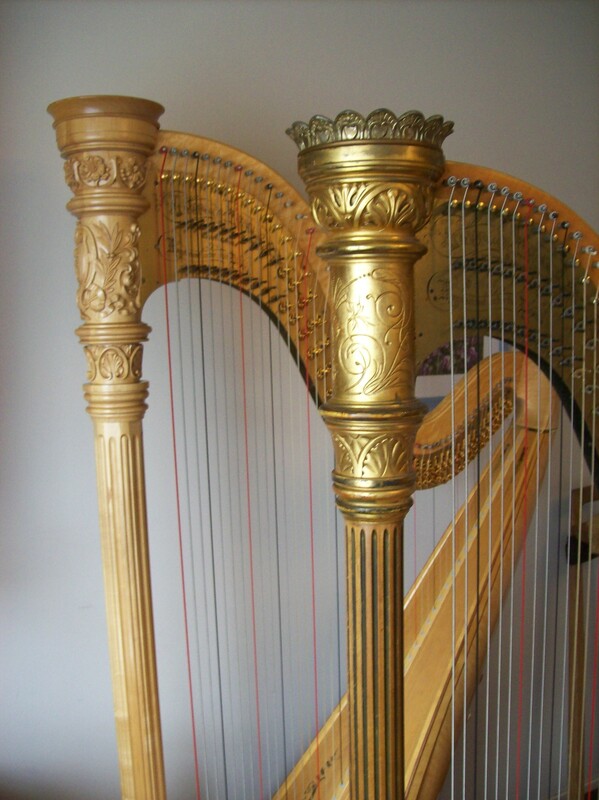 Gently wiping with a damp cloth to prevent the buildup of dirt and grime is good for your harp’s finish. Just wring out the cloth enough so that it isn’t dripping, and make sure you that if any drips or puddles form you wipe them off right away. I’ve come across a lot of harps that have years worth of dirt, grime, body oils, and lotions built up in commonly touched areas like the upper edges of the body and the upper soundboard. In many cases, this happened not because the owners are neglectful, but because of the misconception that dirt is better for the harp’s finish than water. Believe me, a little water from time to time is better than letting a layer of crud discolor your instrument. If there is a layer of gunk on your harp, it’s not too late to get it off. Go ahead and gently wipe it with a damp rag. Use something soft, such as a cotton shirt or a polishing cloth from the music store. You can even use a little mild soap for a really dirty harp. If you apply a little scrubbing pressure, you might cause drips. No worries, just wipe them up. If you try to start cleaning a really dirty harp, something scary can happen. The place you’re scrubbing may become sticky and gooey, and you may be afraid you’re actually dissolving the finish. The first time this happened to me I nearly had a heart attack. But it’s not the finish you’re dissolving. It’s layer upon layer of lotions, deodorants, body oils, dirt, dust, etc. On contact with water many of these materials go back into solution. They may get sticky and difficult to remove. You may feel like you’re just spreading the gunk around rather than taking it off the harp. The best thing to do here is to wipe of some of the stuff and let the rest dry. Come back later and do the same thing. It make take several cleaning sessions, but eventually, you can get most or all of this stuff off your harp. Trying to clean off a dirty spot all at once may tempt you to use too much water or scrub too hard, and then you really can damage or remove some of the finish. Just take it slow, let the area dry and rest, and keep at it. The dirt took years to get there, and you’ll need to be patient in trying to get it off. It’s fine to treat your harp like any other fine finished wood surface. It’s better to keep it from getting dirty, and a little moisture is your friend in this task. Just be careful and conservative. You’ll keep your harp looking newer longer, and a clean harp is a lot nicer to play than a filthy one, wouldn’t you agree? In response to a question from a client of mine, here’s a short video on how to tighten up loose tuning pins. It should work on any make of harp that has pins that run all the way through the neck, as opposed to the zither-type (or Autoharp type) pins that are screwed into the string side and tuned from the string side. As I explain in the video, tuning pins tend to work loose, especially when a string is replaced. All that is usually needed is to push them a little deeper into the hole in the neck. The hole is tapered to fit the shape of the pin, so the more you push them, the tighter they will feel and the better they will hold. I’ve heard of people who try to accomplish this by whacking on the back end of the pins with a hammer or mallet. While this should theoretically work, in practice it rarely seems to, and there’s the danger of that hammer going where you don’t want it to. Try my approach and see how it works for you. Here’s another of the great videos Michele Rassmussen shot at a harp care class I gave at Lyon & Healy West. Here, I focus on the knot used to anchor 4th and 5th octave nylon or gut strings. While you would use a string anchor of some kind to tie strings in the 1st, 2nd, and 3rd octaves (I use one-inch pieces of 5th octave A,B, and C gut strings), the 4th and 5th octave strings are so thick that no anchor is necessary, and using one only makes the whole operation that much more difficult. One of the trickiest things about the larger gut strings is how stiff and strong they are. The key to coaxing them into a knot is to weaken the part you want to work with by pulling it between your finger and thumb with a slight bending motion, as you see in the video. When you’ve done this successfully, the gut will turn from opaque to white. The trick, which comes with practice, is in not weakening any more of the string than you need to tie your knot. With the larger nylon strings, you have the opposite problem. There is nothing you can do to weaken the nylon, so it keeps fighting back. Learning to tie them takes practice and patience. Or, if you prefer, you can avoid them and only string your 4th and 5th octaves in gut. I know gut is much more expensive, but nylon strings in this register really don’t sound good on pedal harps (and pedal-tensioned lever harps). And no, the string makers are not paying me to say this!